The polity is hitting up and the fight against corruption is gradually getting to those politicians who thing they are above the law and untouchable. Reports this morning suggest that unknown gunmen last night invaded the bungalow farmhouse of the Acting Chairman of the Economic and Financial Crimes Commission (EFCC), Mr. Ibrahim Magu and killed a policeman. According to Sources, the gunmen stormed the farmhouse in Karshi in the Federal Capital Territory Abuja at about 10pm and exchanged fire with the policemen on sentry. A police Sergeant was hit and he died instantly. This is the second time that the same the house will be attacked by unknown elements. 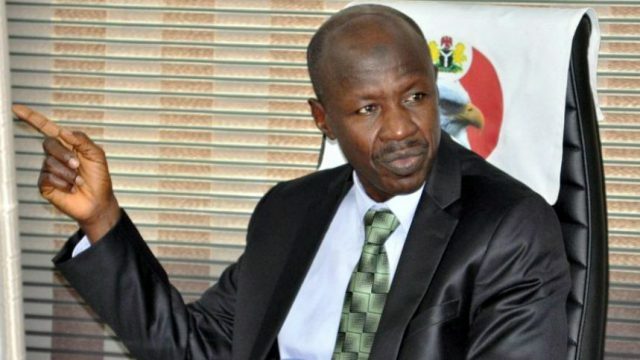 The last 10 months had been tough for Magu because of his refusal to bow to pressure from some high-profile suspects and Politically Exposed Persons (PEPs). Following threats, security was beefed up for Magu and his immediate family leading to the deployment of policemen to the uncompleted bungalow in Karshi. Some suspected elements had also been prowling the family’s house in the Borno State capital and issuing threats. This latest attack came barely 48 hours after Magu said the anti-corruption will be a do-or-die affair. Speaking on Monday after a walk to mark the anti-corruption Day. “For those of us on this side; in the anti-corruption agencies of government, in the media, and civil society, the dagger is drawn and I believe I am speaking the mind of everyone on this side that we intend to neither retreat nor surrender in our noble intention to cure our country of the evils of corruption.